The international port equipment trading company PORTSSOLUTIONS has delivered a second-hand harbor mobile crane Liebherr LHM 550 to the Spanish port of Sevilla. This crane comes from Malabo (Guinee Equatorial) and will be employed by the stevedoring company Estibadora Sevillana that handles general cargo as well as dry bulk, liquid bulk and project cargo. Carlos Kohler from PORTSSOLUTIONS comments that the Liebherr LHM 550 has a maximum outreach of up to 54 meter and is nowadays the biggest crane at the port of Sevilla. The crane has been delivered in a nearly new condition, with just about 500 operating hours. From now on, Estibadora Sevillana will have the big advantage of operating with a crane capable of up to 54m radius and hoisting speeds of up to 120m/min, being able to perform faster and safer loading and unloading port operations. 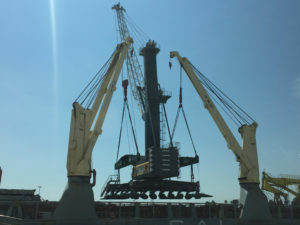 The transportation of the crane from Malabo to Sevilla has been undertaken by one of the world’s leading carriers specialised in heavy lift and project cargo shipping – SAL Heavy Lift. The company’s vessel MV Wiebke delivered the crane to Sevilla, after which the unloading operation was completed in less than one working day.